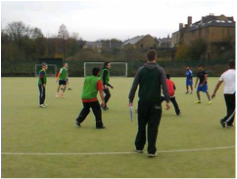 Intra-Soc is an annual day of sporting competition between all of the departments in University of Bradford's departmental societies. Founded in 2014 and organised by The University of Bradford's Association of Clinical Sciences (BACS), it is one of the major sporting events of the year. This year Intra-Soc was held on the 16th November and with a great effort from BOOSA and our friends in Clinical Sciences, we managed to win the event this year. This makes it our first win of the event!